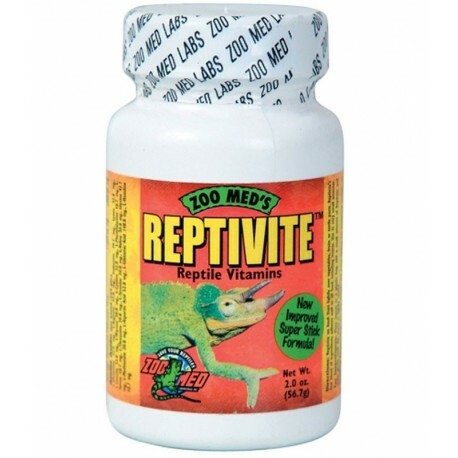 A complete vitamin, mineral and amino acid complex specifically formulated for reptiles. ReptiVite is calcium based to ensure healthy bone growth with the correct 2:1 calcium to phosphorus ratio. A complete vitamin, mineral, and amino acid complex specifically formulated for reptiles. ReptiVite is calcium based to ensure healthy bone growth with the correct 2:1 calcium to phosphorus ratio. Originally developed for the San Diego Zoo to correct soft-shell problems in turtles, it is now used by some of the most respected zoos and animal parks throughout the world. The first reptile vitamin to include the complete amino acid complex, an essential component in protein digestion. ReptiVite does not contain artificial additives or fillers like soy, yeast, or sucrose.